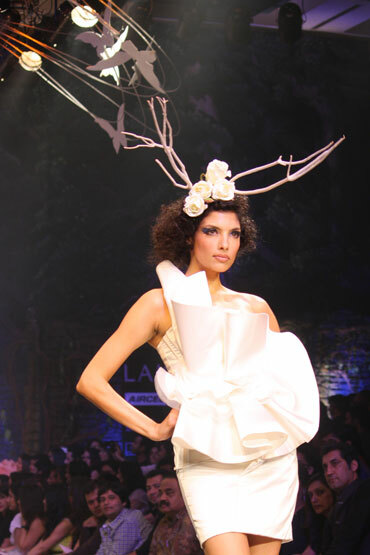 The grand finale at the Lakme Fashion Week in Mumbai on Tuesday night had grand drama in store for fashion watchers. Delhi-based designer sister duo Gauri and Nainika showcased a collection of voluminous gowns, which fellow designers thought was very similar to that of fashion stalwarts such as Oscar de la Renta and Valentino. 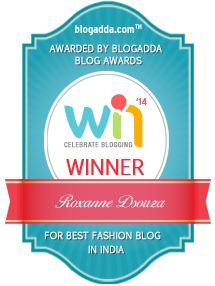 Here's the thing about the grand finale of the Lakme Fashion Week. If it were a movie, we'd have probably given it five stars. 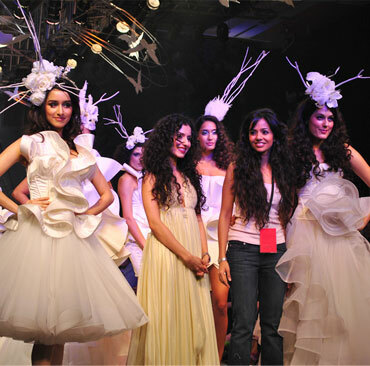 Modern day fairy tale was the theme of Gauri and Nainika's show. So the settings were idyllic woods and the ramp was a replica of a cobbled path. The dresses were based on Lakme's summer palette and the collection was designed in subtle pastel shares with vibrant highlights and feminine tones. Some of these dresses did indeed have a dream-like quality to them. Heck some of them made you wistfully wish you were getting married! It was, however, a fashion show and it did leave a lot to be desired. The ramp for instance was completely ill-equipped for the show dresses of at least a dozen models got stuck at various points on the ramp. And while the stilt dancers were a welcome change in the beginning, towards the end, you were looking forward to seeing the Lakme girls on the ramp rather than seeing them doing a repeat performance of what they'd done twice earlier. For a second it seemed to us that Indrani was confused and even somewhat miffed but the model moved on and even smiled at someone in the audience. Carol Gracias steps out in this silver lace cocktail dress with twisted swirls at the waist. Nicole Faria looking like a painting in a stunning green pencil dress. This mid-waisted dress with tulle flair and sculpted bodice had us swooning. Fiona looks stunning in a silver lace pencil dress with a bustier and leaf details at the shoulder. Lisa Haydon looks stunning in this off-shoulder tulip hemline dress! Maddison McKay in a light yellow lace and tulle flared dress with sculpted draping. Manasvi Mamgai in this taffeta pencil dress with overlapping hem and spiraling flower detail had us weak in our knees! Amrit Maghera strikes a pose in this mid-length white off-shoulder dress. It couldn't get more vintage for Sucheta Sharma in this cocktail dress with a fitted vintage cut jacket. Alecia Raut puts her best foot forward in this pink cocktail dress. We quite liked the asymmetrical hemline inHimangi Parte's light yellow dress. We couldn't help but think of Ms Hepburn when looking at this taffeta and tulle gown with fitted draped bodice. This mermaid lace-and-tulle gown with twisted lace swirls was indeed poetry in motion. Two thumbs up for Hasleen Kaur in this one shoulder tulle gown with draped frills and a layered hem. Blyndes Helgadottir strikes a pose in this gold lace and foil chiffon gown with draped fishnet lace. Lekha Ananthraman in a light yellow lace and tulle low waisted flared gown with swirls at the hip. Lakme girl Vipasha Agarwal in a stunning white tulle and flare dress. Sanea Sheikh in an ice blue mid-waisted duchess satin gown. Racheal Bayros had us swooning in this lace and tulle gown. Mid waisted gowns became more common towards the end of the show. Like this one that Bhawna Pandey wore. 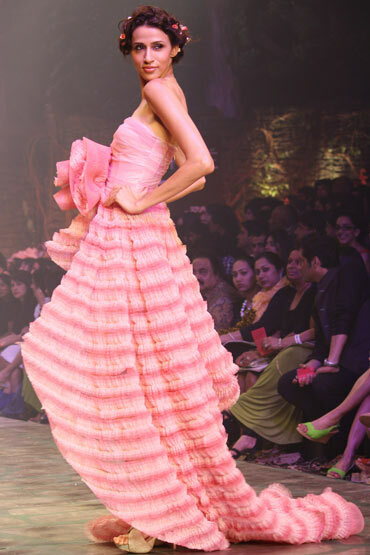 Technically, the collection came to a close with this dress but the Lakme models were yet to take to the ramp. The Lakme girls walked the ramp to a version ofSomewhere over the rainbow as Gauri and Nainika took a well-deserved bow. Some more images from Bharat Student..
Visually I have to agree that it was beautiful indeed, and these are all my dream gowns and dresses, ONLY BECAUSE I know for a fact they are 'Dior Haute Couture' inspired and with the Valentino/Marchesa ruffles, and the fluidity of Oscar de la Renta thrown in here and there.. Still I like them, but I would prefer if they did not try to draw so much inspiration! And they could have definitely used nicer materials and had nicer finishings.. Also did they forget the fact that they showed at 'Lakme Fashion Week Summer - Resort 2011.. I mean where are the 'summer clothes?' or the resort looks? However, Gauri and Nainika are unfazed. “We would rather concentrate on the positives than the negatives, and if some designers think that our work looks like Oscar de la Renta’s, we are flattered. We share the same sensibilities as Valentino, Oscar de la Renta and Marchesa, as all of them do soft designs,” says Gauri. Their spokesperson Arjun Sawhney says, “The comments only show the insecurity of the designers.” Oscar de la Renta could not be reached for comment!